The Value Clamp node sets limits the values of the image between a min and max range and applies an interpolation profile to the values within the range. Img VALUE image. Min: 0.0. Max 37.57. Img VALUE image. Min: 0.0. Max 20.0. Drag the Value Clamp icon into the Node Graph. Adjust the attributes of the Value Clamp node. Img An image of VALUE color mode. Note. If the input image is not of VALUE color mode, it is converted to value color mode using the default settings. Min New minimum value of the image. Max New maximum value of the image. 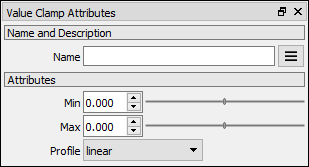 Profile Interpolation profile: linear: Linear interpolation. smooth: Smooth interpolation.. perlin: Faster smooth interpolation. arcin: Circular interpolation. arcout: Circular interpolation.